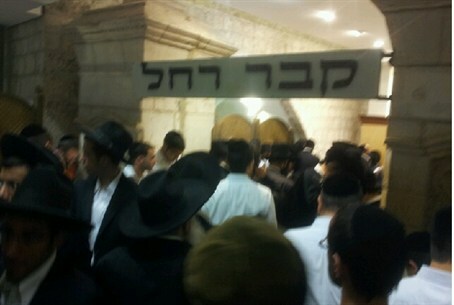 Tens of thousands of people arrived at Rachel’s Tomb on Saturday night for the annual celebration of her life. Tens of thousands of people arrived at Kever Rachel (Rachel’s Tomb) on Saturday night for the annual celebration of her life, which takes place on the anniversary of her passing. From the Arutz Sheva article on the Matriarch Rachel: Because of the many obstacles and sorrows she faced, her quiet way of confronting challenges and her showing us the way to do the same, Rachel Imeinu, Mother or Mame Rochel to the Jewish people, is remembered in Jewish hearts for over 3600 years. Women, especially, feel that her life echoes their challenges and sorrows. Mother Rachel saved her elder sister Leah the humiliation of being found out when their father Laban had Leah married to Jacob instead of her, suffering in silence and not telling her beloved betrothed, who had worked for her for seven years, about the deception - even to the point of giving Leah tips that would prevent Jacob from realizing that his veiled bride was someone other than the one he had chosen . She later married Jacob and was the wife he loved, but was barren, and when she finally was able to conceive, died giving birth to her second son, so that she did not even raise her longed-for children. Rachel, who died on the way back to the Promised Land, was buried on the wayside in Bethelehem, not next to Jacob who is in the Cave of the Patriarchs in Hevron. When Jacob lay dying in Egypt decades later, he told his son Joseph, still feeling the heavy loss: "And on my way from Padan Aram, Rachel left me." The Jewish people have always prayed at her grave, and when exiled to Babylon, passed it and called for her to pray for their redemption. The midrash says that she showed the Almighty how she helped her sister and asked Him to forgive the slights His people caused him in the same fashion as she did. Jeremiah gives the answer in Chapter 31, as G-d tells her not to cry for her sons, because they will one day return. About 13,000 people had arrived at the compound from Thursday evening to Friday afternoon. A total of about 70 thousand people are expected by Sunday. This year the anniversary of the matriarch Rachel’s passing fell on the Sabbath, when observant Jews do not travel. Those marking the anniversary compensated by moving celebrations of her life to the days immediately before and after. As part of the preparations for the celebrations, volunteers from the Ichud Hatzalah organization, including doctors and paramedics, were deployed starting on Thursday afternoon at Rachel's Tomb. As of Saturday night they treated 13 people, including three who were evacuated to hospital. Most of the casualties suffered bruises and injuries as a result of the crowding in the area. The Egged bus company, which had been providing transportation to the compound, could not handle the large number of visitors, and, as can be seen in the following video, on Saturday night tens of thousands of people began marching on foot from Jerusalem's Gilo neighborhood to the compound.